It’s a dark, clear and unseasonably balmy November Monday night when the 125 members of the Island Community Chorus meet to rehearse in Trinity Church in the Campground, the gorgeous high-ceilinged church with narrow stained-glass windows, a white ceiling, and white walls — emphasis on walls — for the Methodist laity and the community to enjoy when nippy weather descends and the cavernous Tabernacle, sans walls, is done for nine months of New England’s parsimonious handout of warm days. One can only imagine that people are aware of whether they can sing or not sing well. This reporter certainly knows she should try out big vocals only when alone in the woods, with just her dog to horrify. Members of the chorus will tell you there may exist less-than-great singers in the group, but they get swallowed whole by the beautiful voices surrounding them: There’s some kind of law of physics that allows a non-singer to lift her voice to a celestial level, provided those celestial vocalists are in place. Certainly this is what happens in this small but acoustically divine church, where the large band of singers take up virtually every pew space, as conductor Peter R. Boak waves his baton, and the whole of the choir chimes in: sopranos, altos, tenors, then basses. If one is lucky enough to be sitting meekly listening in the corner, the beauty of the choral music is unworldly. The jaw drops — it truly does — and the words “music of the spheres” come to mind. On this Monday rehearsal night, Mr. Boak takes the sopranos through an obscure lullaby, “Petit Enfant,” by Linda Miller Shaw and Dana Thompson. Even with the stop and go of rehearsal, hearing the music reverberate between the high walls conveys pure bliss. When the practice changes to pieces involving more voices, Mr. Boak warns the singers not to go “too Wagnerian.” On the two days of performances in early December at the Whaling Church, the chorus will follow the newly formed Martha’s Vineyard Children’s Chorus, and the conductor encourages them to build their subsequent adult sound slowly and respectfully. The first two songs have been unfamiliar yet utterly beautiful, lush. Now the chorus members take out their next pamphleted song and render up a jazzily syncopated “We Three Kings,” which includes a few measures of “doo-bop do-bop doo-bop do-bop.” At a certain point Mr. Boak stops them and scolds, “You’re not having as much fun as you should.” Fun? For the sobersides “We Three Kings of Orient are, bearing gifts, we traverse afar”?! But, yes, the choir dishes it up with a sense of what a giddy trip these monarchs on camelback are having, or maybe they’re racing under “yonder star” in all-terrain vehicles? It certainly sounds as if they might be. 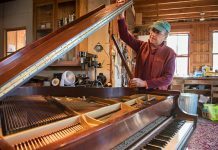 Music director Peter Boak has Island roots going back 100 years. He settled here permanently in 1994 after careers as a music teacher in Lafayette, La., and as a full-time church musician in Summit, N.J. 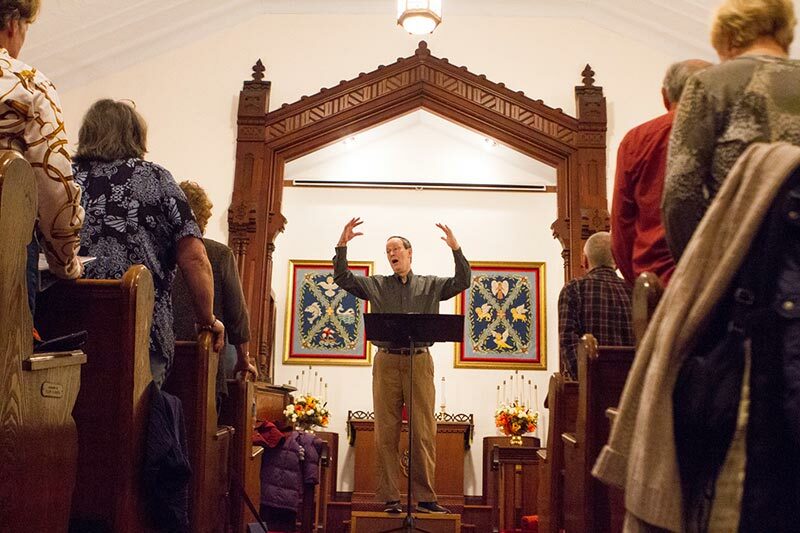 In addition to directing the Island Community Chorus, he is the minister of music for the Federated Church in Edgartown. At his right hand is pianist Garrett Brown, a resident of the Island since 1997. His piano lessons began at the age of 4, and he received a bachelor of music degree from the Westminster Choir College of Princeton, N.J. On the program from last spring’s grand presentation of the Brahms Requiem, both Mr. Boak and Mr. Brown, in addition to these and other distinguished musical credits, took a moment to cite their pets: Mr. Boak resides in Oak Bluffs with his cats and a puppy named Sadie. Mr. Brown lives in Oak Bluffs with his two dogs, Olive and Wafer. 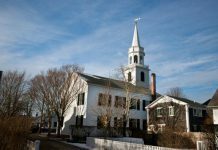 The Christmas celebration this year will take place in another vaunted acoustical venue — this one large enough to contain both the bulging choir and a large, appreciative audience: the Whaling Church of Edgartown. The dates are Saturday, Dec. 3, at 7:30 pm, and Sunday, Dec. 4 at 3 pm. For more information and/or to buy tickets, log on to islandchorus.org.